Why is cleansing the liver with good food and herbs necessary? Because in today's world many of us are overtaxing the liver, and we don't even realize it, Everything from stress to environmental pollutants impact this vital organ, and once it is overtaxed, it no longer processes these toxins and waste from the body. 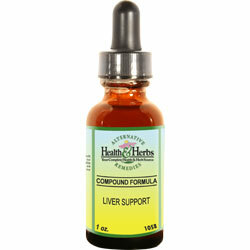 The main role of the liver is to take the nutrients we eat and make them into compounds that will benefit the body. So it is essential to keep it clean, not only to help with digestion but to get rid of the toxins that can build up over time. The organ also stores glucose, which can be converted to usable sugar when blood sugar levels fall below normal. Keeping your liver healthy is a matter of controlling what you eat, and drink, exercising and reducing your exposure to toxins. Using herbs, like those in the formula, that is considered to be an Alterative in its actions, or 'Blood Purifiers', to aid in the assimilation of nutrients and eliminate waste. Barberry root bark is usually included in combination herbal formulas for the liver. Barberry bark extracts contain a number of physiologically active alkaloids, the most useful being berberine, and it has been compared to Oregon Grape root and Goldenseal in its properties. The bitter compounds in Barberry stimulate digestive function following meals, as well as it stimulates immune system cells to function better. Barberry is considered to be effective for lowering blood pressure, reducing heart rate and respiration, and for inflammation of the gallbladder, gallbladder pain and gallstones, It has also been shown to have some antibacterial activity, which accounts for it use as an antiseptic when applied to the skin for skin conditions including acne and psoriasis. Dandelion is a humble weed, that has been used throughout the ages as a liver cleanser. It is also an amazing diuretic, that also helps to boost the removal of toxins from the body. Dandelion leaf extract stimulates bile flow and often used by herbalists to help fight cirrhosis, fatty liver, estrogen dominance and even acne. The plant extracts are rich in zinc, iron, and potassium. The remedies made from the Horehound herb, Marrubium vulgare, is thought to be an important bitter tonic and is usually used to enhance stimulate the liver, for poor appetite and to promote a working digestive system as a whole. It is believed to have the ability to control certain liver and gallbladder disorders. Another use of Horehound in folk medicine was for easing the pain of intestinal gas, excessive bloating, muscle cramps, including the pain and swelling that is often associated with menstrual cramps. Horehound is also known to help increase immune system function. Research is underway to investigate the plant extract's ability to lower blood sugar levels. Yellow Dock Root is known by herbalists as a blood purifier and is commonly used to cleanse toxins from the body, specifically the liver. It does this by breaking down fatty foods by stimulating bile production. This action of the herb is known to enhance normal liver detoxification, improve overall digestion, and it has diuretic effects to help flush out harmful substances. St. John's Wort, Hypericum perforatum, is best known as an herb for relieving depression, and this is why. The herbal extract has a way of detoxifying the pathways in the liver to help it release stored nutrients into the bloodstream. It is considered to be a liver detox herb my many herbalists, that is said to be so powerful that it even destroys drug effects, prescription and so-called "recreational" drugs, rendering them impotent and ineffective. This action can be a drawback for someone on the heart or other crisis intervention medications. Chamomile flower, Matricaria recutita, has long been recognized for its calming properties and is now listed on many sites as one of the top detoxing herbs. This may be because it has laxative properties and therefore helps to move debris through the intestines. This action can soothe the way for liver detoxification. Chamomile contains anodyne compounds that are anti-spasmodic, which helps to relieve cramping, constipation and other stomach pains. Many of these benefits are due to the herb's natural relaxing effects. Since the brain and the gut communicate directly, a relaxed mind may also help to heal leaky gut and auto-immune disorders such as Irritable Bowel Syndrome (IBS), and Crohn's disease. The health benefits of Tansy leaf can be attributed to its properties as an anti-fungal, antiviral, anti-inflammatory, antibacterial, febrifuge, sedative and anti-histaminic actions. Tansy leaf, Tanacetum vulgare, contains carminative properties that help to improve digestion and ease dyspepsia. It has been used traditionally for digestive disorders including intestinal worms and parasites, and intestinal and stomach ulcers, bloating, gas, gallbladder problems, stomach spasms and pain. Wood Betony has an affinity for the head, (especially for the circulation to the brain) as well as the liver and nervous system. The gastrointestinal tract and the nervous system are intertwined, as the system many nerve cells of its own. Wood Betony has been used to detox the liver and to improve liver function, as well as for gallbladder complaints. In Europe, the herbal extract is used to help with gas, stomach cramps, bloating, diarrhea, and is known for soothing the entire digestive system. Recent studies show that the plant's active constituent, trigonelline, may be very helpful for lowering blood sugar levels. Ingredients: Barberry Bark, Dandelion Root, Horehound, Yellow Dock Root, St. John's Wort, Chamomile, Tansy, Wood Betony, Structured Water, 20% Alcohol. Non-Alcohol: Barberry Bark, Dandelion Root, Horehound, Yellow Dock Root, St. John's Wort, Chamomile, Tansy, Wood Betony, Structured Water, Vegetable Glycerin.